General admission provides viewing of the MFAH art collections and most exhibitions. General admission is free each Thursday courtesy of Shell. Tickets are not required for Thursday visits, drop in at your convenience. Admission is always free for children aged 12 or younger. Upon your arrival, exchange the voucher for your admission ticket. Then enter the museum for your self-guided tour of the permanent collection. 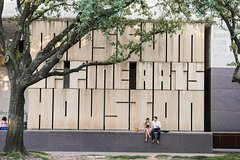 The MFAH art collections and exhibitions are presented primarily in the Museum’s Susan and Fayez S. Sarofim Campus two main gallery buildings: the Audrey Jones Beck Building and the Caroline Wiess Law Building. The Law Building features galleries for changing exhibitions as well as the MFAH collections of Asian, African, Islamic, Native American, Oceanic, Pre-Columbian, and Modern and Contemporary art. The Beck Building features galleries for changing exhibitions as well as the Museum's collections of ancient art, European art, photography, prints and drawings, and American art to the mid-20th century. The Museum's shop and café are also located in the Beck Building. Entrance to special exhibitions, films and events require additional expense. Please check for details on the day of your visit. Go to mfah.org for parking information to assist your visit.